road situations at high speed with low power consumption. it relies on a huge number of multiply-accumulate (MAC) calculations. 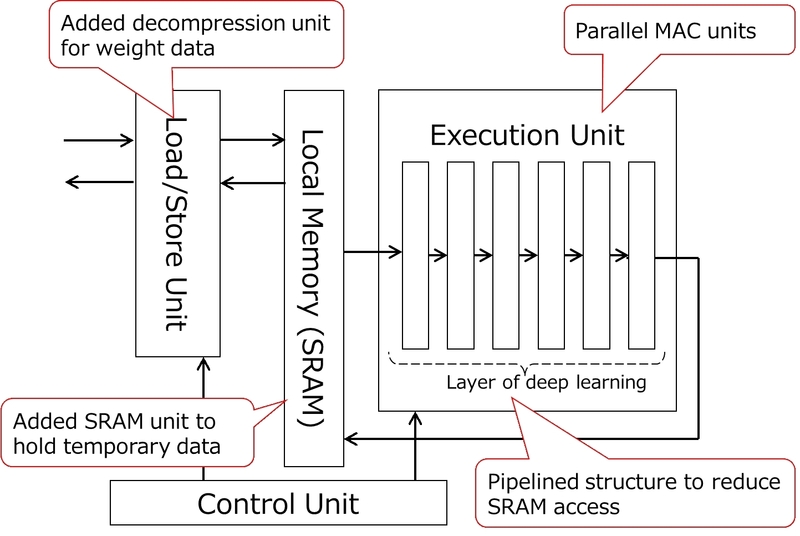 DNN with conventional high-speed processors also consumes too much power. learning in hardware. It has three features. Parallel MAC units. DNN processing requires many MAC computations. Toshiba’s new device has four processors, each with 256 MAC units. This boosts DNN processing speed. stored in DRAM in advance, are loaded through the decompression unit. service names may be trademarks of their respective companies. outstanding solutions in discrete semiconductors, system LSIs and HDD. billion) and to contributing to a better future for people everywhere.